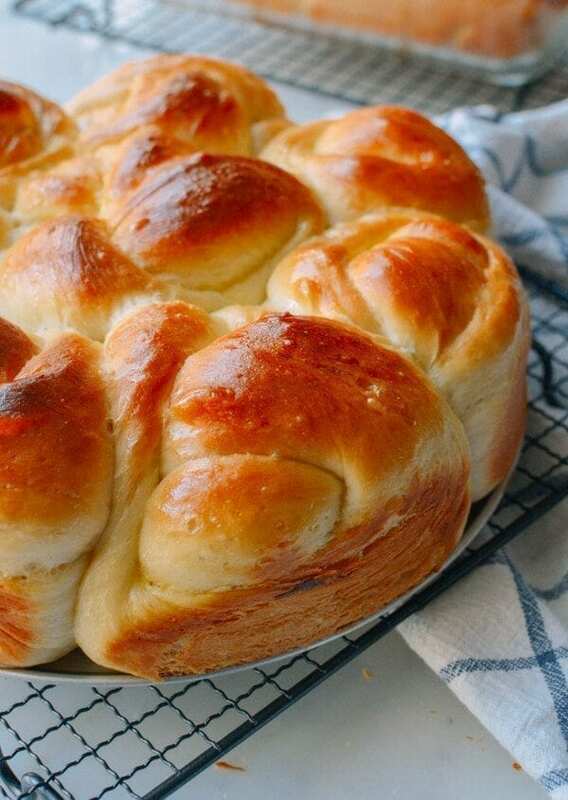 This Asian milk bread recipe is a triumph. For months, we have searched and tested finally have a perfect recipe for soft, buttery Chinese bakery milk bread. In the bowl of a mixer, add ingredients in the following order: heavy cream, milk, egg, sugar, cake flour, bread flour, yeast, and salt. Use the dough hook attachment, and turn on the mixer to “stir.” Let it go for 15 minutes, occasionally stopping the mixer to push the dough together. If you’re in a humid climate and the dough is too sticky, feel free to add a little more flour ¼ cup at a time until it comes together. If you don’t have a mixer and would like to knead by hand, extend the kneading time by 5-10 minutes. After 15 minutes of kneading, the dough is ready for proofing. Cover the bowl with a damp towel and place in a warm spot for 1 hour. We proof the dough in our oven (We turned on our oven’s rapid proof setting for 5 minutes, turned the oven off, and then closed the oven door). The dough will grow to 1.5X its original size. In the meantime, grease two baking vessels on all sides with butter, such as 2 standard loaf pans or even a loaf pan and a 9-inch round cake pan. After the hour of proofing, put the dough back in the mixer and stir for another 5 minutes to get rid of air bubbles. Dump the dough on a lightly floured surface, and cut it in half. You can make a loaf with one half of the dough by cutting it into 3 pieces and placing them in the loaf pan. With the other half of the dough, cut it into eight equal pieces and make buns. You can really shape the dough however you like. Once shaped, let the dough proof for another hour. Preheat the oven to 350 degrees F. Brush the risen dough with egg wash. Bake the loaves for 23-25 minutes. Remove from the oven and brush the buns with sugar water to give them a great shine, sweetness, and color.